The first dance manual to describe the minuet in detail was Gottfried Taubert’s Rechtschaffner Tantzmeister, published in Leipzig in 1717. This German treatise is a mine of information on all aspects of learning to dance but, without a complete and accessible translation into either English or French, it has remained little known compared to other dance manuals of the 18th century. With the publication in 2012 of a complete English translation it is now widely available for use and study. I will be drawing on this translation for my posts. Gottfried Taubert. 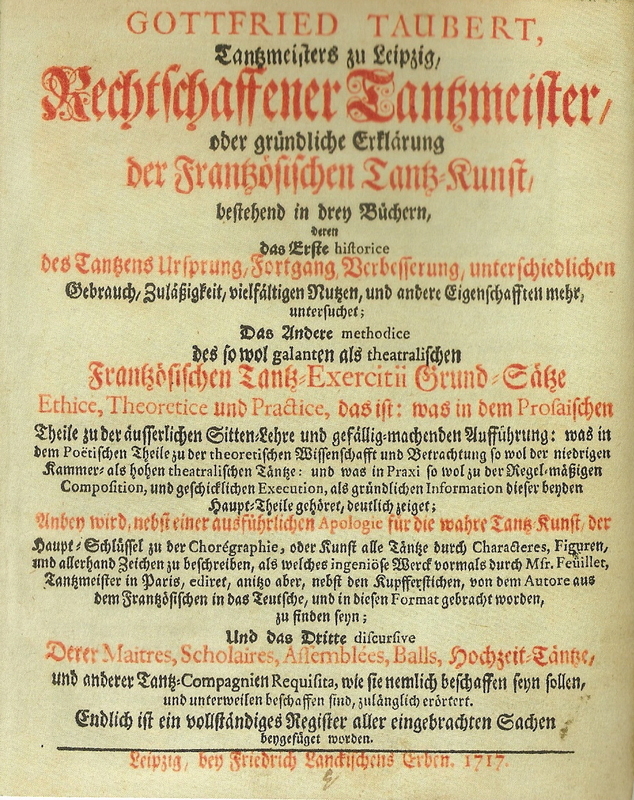 Rechtschaffener Tantzmeister (1717). Title Page. As Taubert’s translator Tilden Russell makes clear, the minuet was central to Taubert’s view of the 18th-century world of dancing. In this post, I will look at his general approach to teaching rather than his specific instructions for the steps and figures of the minuet. In his Foreword, Taubert declares he will provide ‘a clear, methodical and thorough introduction to the theory of the well established art of French dancing’. He makes clear that he will be ‘mainly concerned with presenting a comprehensive discussion of both the theory and practice of the three world-renowned fundamental dances’. He identifies these as the courante, the minuet and the bourée, although his focus throughout most of the treatise is the minuet. He uses the term ‘la belle danse’ for the style and technique used in ‘all ballroom dances’ and makes his debt to French dancing abundantly clear. So far as Taubert was concerned, the French were undisputed rulers of the world of dance. Taubert lays great emphasis on the necessity for the systematic teaching of dance. He begins with la belle danse and ballroom dancing, setting out his ‘instruction of the fundamental dances and general method’. Fifth, how to read and understand the symbols in Feuillet’s Choregraphie as well as the notated dances. He promises that ‘all this shall be examined topic by topic, methodically and coherently’. Standing and walking get a chapter each, followed by five chapters on bowing. Taubert is adamant that dance instruction should not begin until the student has mastered ‘how to stand gracefully; how to walk with ease; and how to bow politely and make the proper révérences for any occasion’. ‘the air or manner with which one should dance’. Each and every one of these is as important to the modern student of baroque dance as it was to the 18th-century dancing master and his pupils. All are fundamental to an accomplished performance of the minuet. Before I turn to the teaching of steps and figures of the minuet and other dances, I will take a look at what Pierre Rameau and Kellom Tomlinson have to say about the fundamental aspects of dance technique. This entry was posted in Ballroom Dancing, Dance Treatises & Notations, Dancers & Dancing Masters, The Minuet and tagged Baroque Dance, Gottfried Taubert on June 11, 2015 by moiragoff.